The ability to creatively express ones thoughts and feelings by putting pen to paper is perhaps the most important stage in a child’s development. Visualising, drawing and finally displaying their creation is a fundamental stepping stone used by parents and teachers to build both confidence and self-belief. However, in order for a child to have this opportunity they must first have the correct tools available to them, with this in mind it’s time to arm your children with the BIC® Kids colouring range. Years of research and manufacturing know-how have gone into the development of a complete range of colouring materials that caters for all ages. From toddlers to early teens, there is something for everyone. BIC® Kids extensive knowledge and expertise in child development has led to its ‘Recommended by teachers’* stamp displaying a recognisable mark of quality for all to see. But the product recommendations do not stop there, three of BIC® Kids core products: Evolution™ colouring pencils, Kid Couleur felt pens and Plastidecor® have been marked as European market leaders** in their field. The real icing on the cake though is that three products featured in the range are created using recycled materials in Europe. Find fun activities and exercises on Bic® Kids website ! Having recently developed a website www.bickids.com, BIC® works tirelessly to help a child to partake in an abundance of fun activities throughout their play time. With its specially designed Kid’s corner featuring more than 300 activities including folding exercises, colouring sheets, hand writing tips and memory games, your child will never miss a chance to stretch their creative skills. Parents and teachers can also get involved with their own special areas featuring the latest in child development news, lesson plans and activity ideas to get their child’s creative juices flowing. 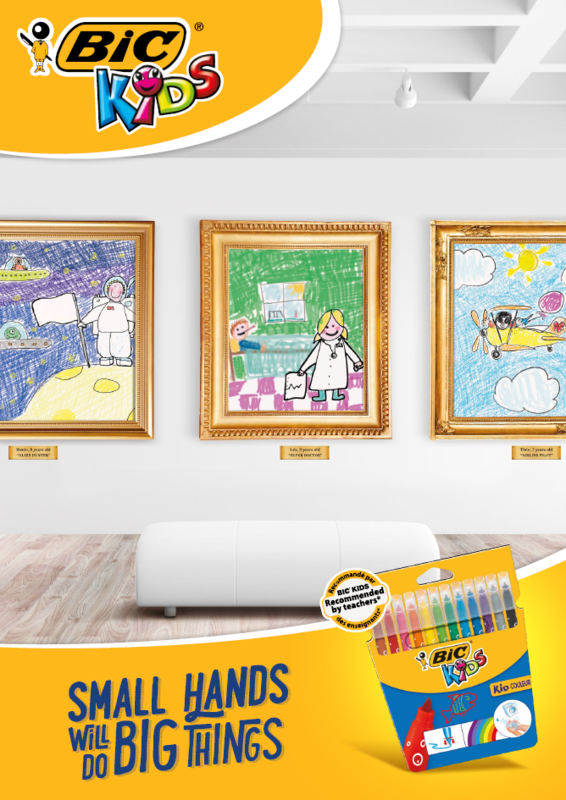 With the right care and attention a child can develop right before your eyes, as BIC® Kids always says Small hand will do big thing. *Average score of 88% product recommendation in BIC KIDS colouring range, based on two studies conducted by Markteffect research firm in France in January 11, 2013 (with 227 teachers) and May 6, 2014 (with 387 teachers ).